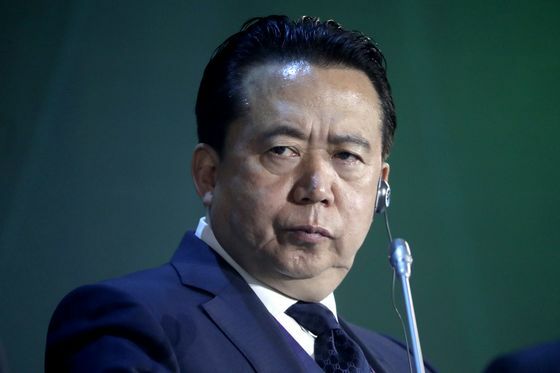 (Bloomberg) -- The wife of former Interpol President Meng Hongwei said she’s asked French President Emmanuel Macron to discuss her husband’s disappearance on a trip to China last fall when Chinese President Xi Jinping visits France this week. In an interview on France 24 television, Grace Meng said she wrote to Macron in advance of Xi’s visit, asking for help in protecting her family’s “fundamental human rights.” Her husband, who’d worked at the international law-enforcement agency’s headquarters in Lyon, was reported missing after departing France for China on Sept. 29. China’s Ministry of Public Security later said he was being investigated on allegations of accepting bribes and violating other laws. In Sunday’s interview, Grace Meng said she’s had no information about her husband since his disappearance, and fears he’s being punished for his “reformist views, particularity in the field of the law.” In January she sought asylum in France for herself and the couple’s two sons. Xi arrived in France Sunday for a three-day visit. He’s due to hold talks with Macron and attend a state dinner in Paris on Monday.